The market for bulk acoustic wave (BAW) devices has witnessed a significant rise in investment aimed at the development and commercialization of these devices across an increasing number of application areas. These devices find applications in high-end applications across industries such as telecommunications and consumer electronics. For a long time, the high prices of BAW devices restricted their use to industries such as military and defense, however, encouraging R&D activities have allowed the development of low-cost devices over the past few years, significantly increasing their set of applications. Of late, the market has witnessed a vast rise in demand due to the emergence of the 4G technology. BAW devices are considered superior substitutes over surface acoustic wave (SAW) devices as the former are more compact and suitable for handset designs. Rising demand for miniaturized consumer electronic devices is expected to significantly benefit the global demand for bulk acoustic wave devices in the next few years. The market is also witnessing thorough research activities focused on the reduction of the cost of devices, which could further help their commercialization, driving the market. Transparency Market Research states that the global bulk acoustic wave devices market will exhibit a promising 9.3% CAGR over the period between 2017 and 2025, rising from a valuation of US$860.4 mn in 2016 to US$1869.6 mn by 2025. The global bulk acoustic wave devices market has been segmented in the report in terms of device type into filters, resonators, and transducers. Of these, the segment of filters accounted for a massive chunk in the overall revenue of the global BAW devices market in 2016. The segment valued at US$510.6 mn in 2016 and is expected to remain the leading segment, exhibiting a promising 9.3% CAGR from 2017 to 2025. Bulk acoustic wave filters are preferred over the traditionally used surface acoustic wave filters owing to their several advantages such as much smaller shapes and sizes and capability of providing higher frequency despite having smaller form factor compared to surface acoustic wave filters. These factors make BAW filters the most preferred filters in 3G and 4G applications. Furthermore, bulk acoustic wave filters are much less sensitive to temperature variations at wide bandwidths. This provides steep filter skirt with low loss. Thus, as the usage of 4G technology increases, the demand for BAW filters is also expected to grow over the forecast period 2017 to 2025. Asia Pacific dominated the global market for BAW devices in 2016, retaining its position as the leading contributor of revenue to the global market. The market for BAW devices in Asia Pacific is primarily driven by high concentration of semiconductor companies in emerging countries such as China, Taiwan, Japan, South Korea and India. Moreover, most of the world’s leading telecommunication and consumer electronics companies have their manufacturing facility in this region. Thus, the demand for bulk acoustic wave devices in this region is expected to remain strong in the next few years as well. North America, which is another promising regional market for BAW devices with high-growth potential, is also expected to retain its position as one of the leading demand drivers and contributors of revenue to the global market. The aerospace and defense industries in the region are the key consumers of a variety of BAW devices. U.S. held the dominant market share in terms of revenue in the North America BAW devices market in 2016. Some of the leading players operating in the global bulk acoustic wave devices market are Tai Saw Technology Co. Ltd. (Taiwan, China), Taiyo Yuden (Tokyo, Japan), Skyworks Solutions (Massachusetts, U.S.), TDK Corporation (Tokyo, Japan), Murata Manufacturing Co. Ltd. (Kyoto, Japan), Honeywell International, Inc. (New Jersey, U.S.), Teledyne Microwave Solutions (California, U.S), Kyocera Corporation (Kyoto, Japan), Infineon Technologies AG (Neubiberg, Germany), API Technologies (Massachusetts, U.S.). Bulk acoustic wave devices could be made functional below 500 MHZ but the band at which the bulk acoustic wave devices finds application for the commercial purpose is mostly at 1.8 GHz to 1.9 GHz. The bulk acoustic wave ladder filters which are in the band of 1.8 GHz to 1.9 GHz are increasingly preferred over more commonly used surface acoustic wave devices, providing enhanced performance and efficiency. Moreover, the bulk acoustic wave devices are much more compact in size and thus they help in providing size reduction in mobile handsets and other portable consumer electronics devices. The highest rate of penetration for bulk acoustic wave devices has been in the personal communication services (PCS) which are wireless phone services, very similar to cellular telephone services with more emphasis on extended mobility and personalization in the service. The personal communication services (PCS) is also referred to as digital cellular (digital cellular). There is a lot of investment being focused at development and commercializing of the bulk acoustic wave devices over the past few decades. The bulk acoustic wave devices market has penetration in markets like consumer electronics and telecommunication industry from high end industrial uses like military and defense. Bulk acoustic wave devices were mostly used in the field of defense and aerospace due to their high price. But with a lot of investment in research and development it has been made possible to develop bulk acoustic devices which could be commercialized across a wide range of sectors. Further the bulk acoustic wave devices have high penetration in universal mobile telecommunication system (UMTS) sector. The reduction in the cost of the bulk acoustic devices has enabled the devices to replace duplexer’s technology and other traditionally used filter technologies, thus driving the demand for bulk acoustic wave devices over the forecast period. 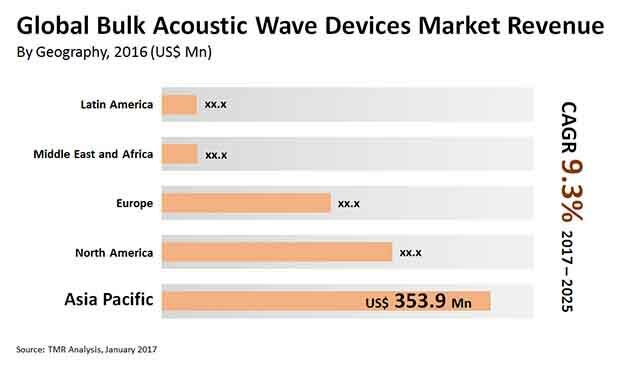 Migration of bulk acoustic wave devices to higher frequency is expected to be a key opportunity for the market growth in the near future. Further potential integration of bulk acoustic wave devices into active integrated circuit is another key opportunity for the market growth in the near future. The bulk acoustic wave device by device analysis could be segmented into filters resonators, transducers and others. The bulk acoustic wave devices by end use industry could be segmented into aerospace & defense, telecommunication, environmental and industry, automotive, consumer electronics, healthcare & medical and others. The global bulk acoustic wave device by geography has been broadly segmented into North America, Asia Pacific, Europe, Middle East and Africa and Latin America. The market report deals in the forecast of the bulk acoustic wave devices market in terms of revenue (USD million) as well as the CAGR for the forecast period 2016 to 2027. The competitive profiling of the key players in the global Bulk acoustic wave devices market has been comprehensively covered under the scope of the report. The key players in the BAW Devices Market have been competitively profiled across the five broad geographic regions. This competitive landscape is inclusive of the various business strategies adopted by these major players and their recent developments in the field of SAW devices. In order to provide a detailed insight into the market dynamics of global Bulk Acoustic Devices Market, the drivers and restraints affecting the industry are included in the study. Market dynamics include market opportunity, drivers and restraints and an extensive analysis of these factors are included in the report. Furthermore, market attractiveness breakdown has also been provided in the report. Therefore, the report provides a comprehensive study of the global Bulk acoustic wave devices market and also offers the forecast of the market for the period from 2017-2025. Some of the key players operating in the bulk acoustic wave devices market include Tai Saw Technology Co. Ltd. (Taiwan, China), Taiyo Yuden (Tokyo, Japan), Skyworks Solutions (Massachusetts, U.S.), TDK Corporation (Tokyo, Japan), Murata Manufacturing Co. Ltd. (Kyoto, Japan), Honeywell International, Inc. (New Jersey, U.S.), Teledyne Microwave Solutions (California, U.S), Kyocera Corporation (Kyoto, Japan), Infineon Technologies AG (Neubiberg, Germany), API Technologies (Massachusetts, U.S.).